In the Colt Starting Series, Clinton covers every aspect of starting a young horse from catching a wild horse to safely walking, trotting and cantering on a loose rein both in the arena and on the trail. The series is filled with countless success tips, safety precautions and troubleshooting advice. With the experience of starting over 600 wild brumbies straight from the Australian Outback, there isn’t a colt starting situation Clinton hasn’t found himself in and doesn’t know the solution to. He learned his colt starting technique from the renowned Aussie horseman, Gordon McKinlay, heralded in his lifetime as the “King of the Roundpen” for his ability to gentle wild horses. Incorporating Gordon’s philosophy of thoroughly preparing a young horse on the ground and using a helper during the colt’s first three rides, Clinton’s focus on safety for both horse and rider makes his method the practical and smart choice for building a lifelong partnership. In the series, Clinton works with a wild mustang to best demonstrate how effective his method of colt starting is, covering every crucial step to achieving a safe and enjoyable partnership with a young horse. 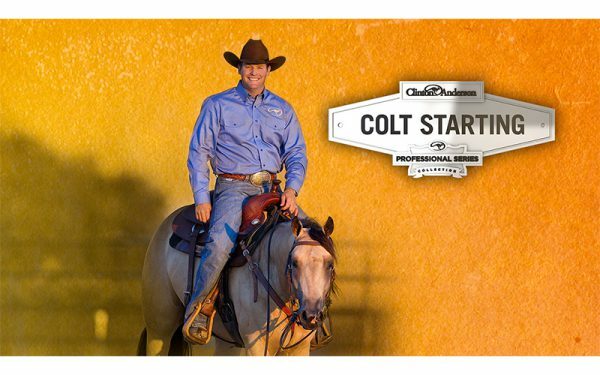 So whether you have a colt you’ve raised since birth or are taking on an untouched prospect, Clinton has your step-by-step guide to getting off to the right start. The digital Colt Starting Series may be accessed on your mobile device using the Downunder Horsemanship app, which is a free download from the App Store and Google Play, and on your computer through the Downunder Horsemanship website. Not sure if the Colt Starting Series is for you? Download our Working With Young Horses information.